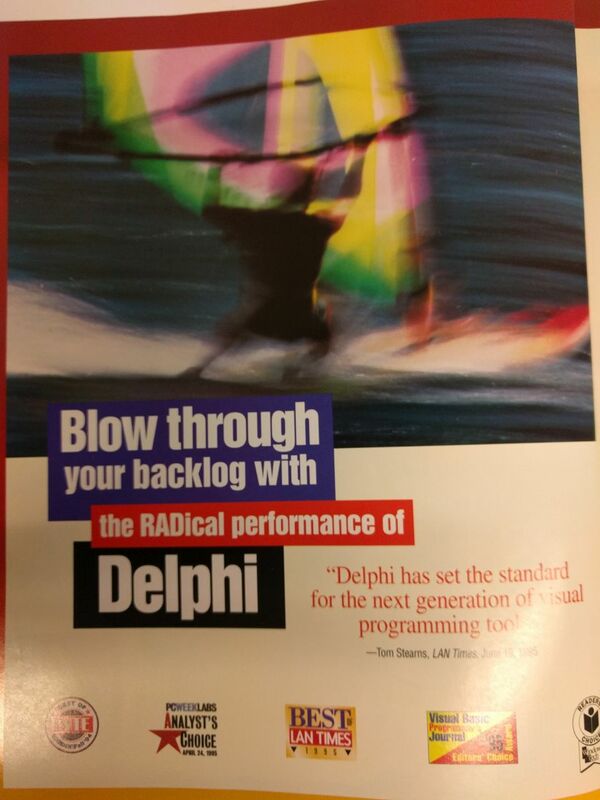 To celebrate another year of success for Delphi. I dug a bit in my archive. 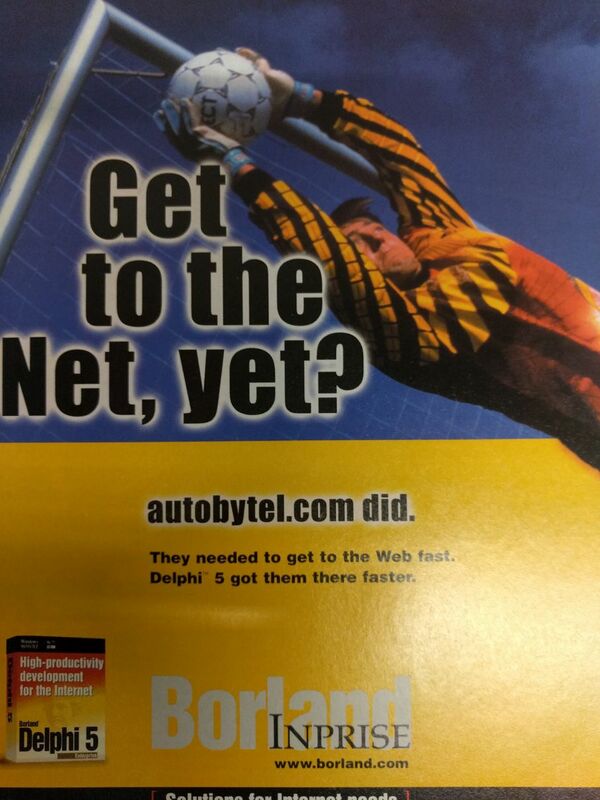 Here are a few old images, mostly ads from Borland, before and after the product release. You can find a higher resolution version of these images at https://goo.gl/photos/WeWa3wEL9xDYAp179. Here are smaller versions, with some comments. 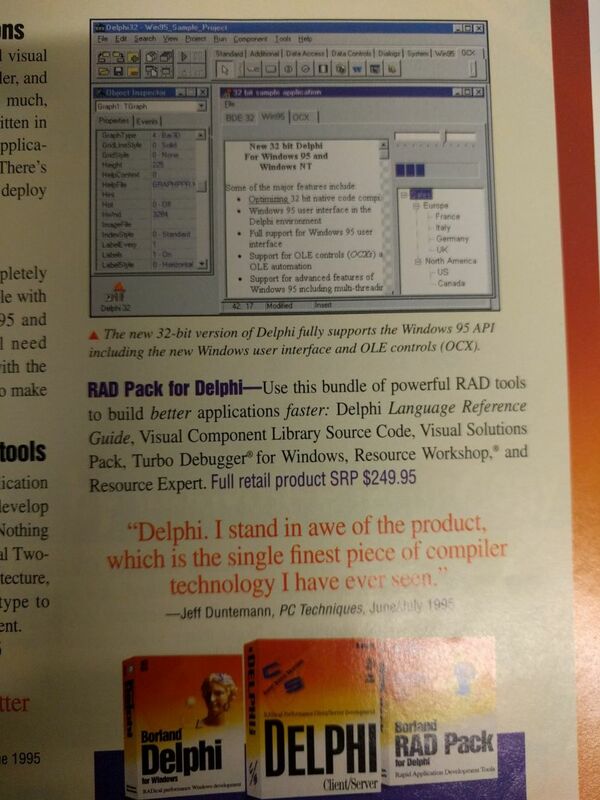 Before Delphi came along, the language, its earlier (and different) OOP model and Windows integration were already there. 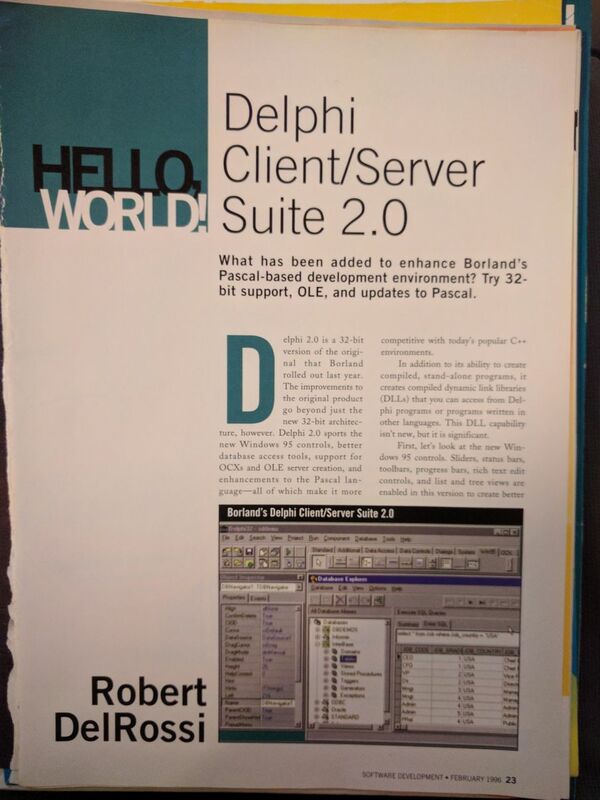 But Delphi had a new object model in the language, the concept of components, and a new library, including strong database access, and it was a breaking change from previous Turbo Pascal products. 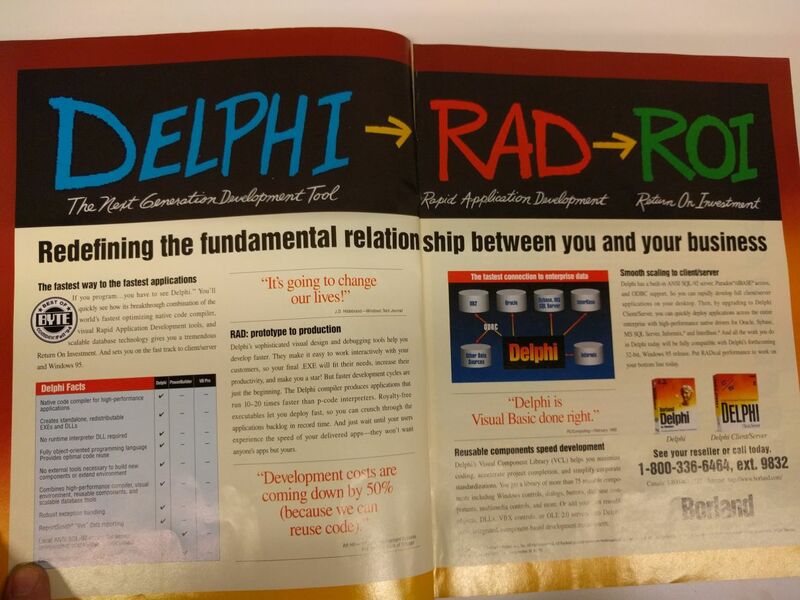 Delphi RAD to ROI. We should use this more today! 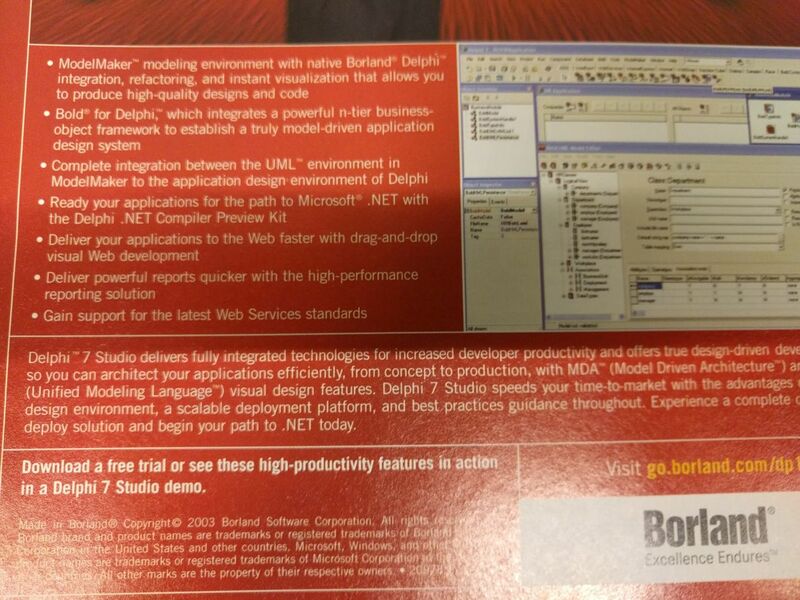 Visual Basic done Right... 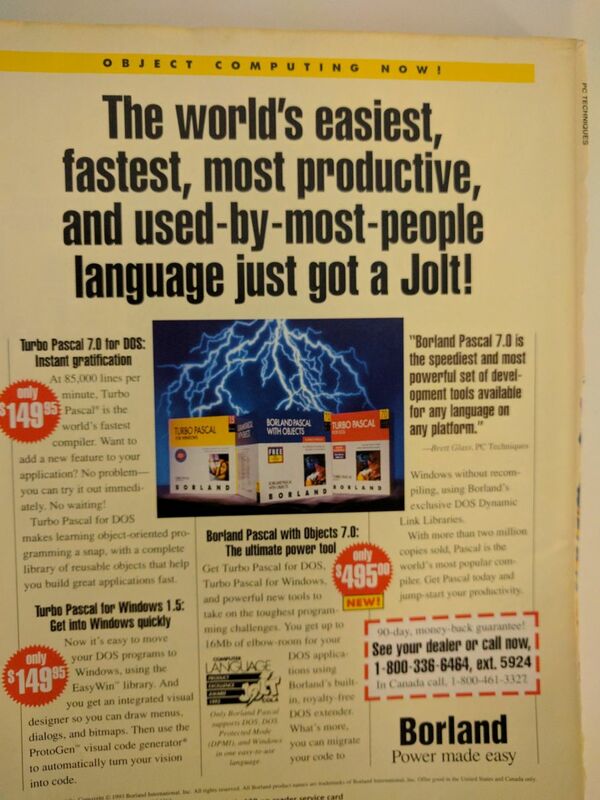 The RADical performance... ready for Windows 95. 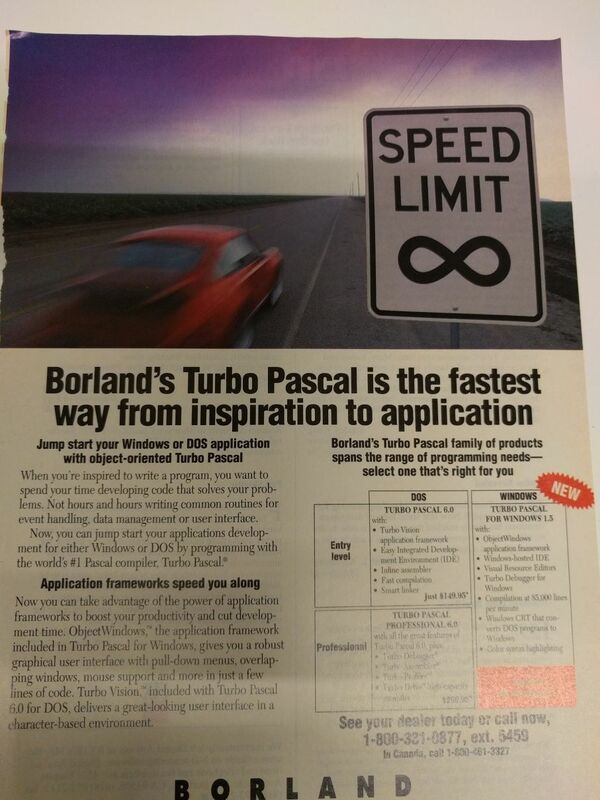 Development got easier (with the family of Borland tools). 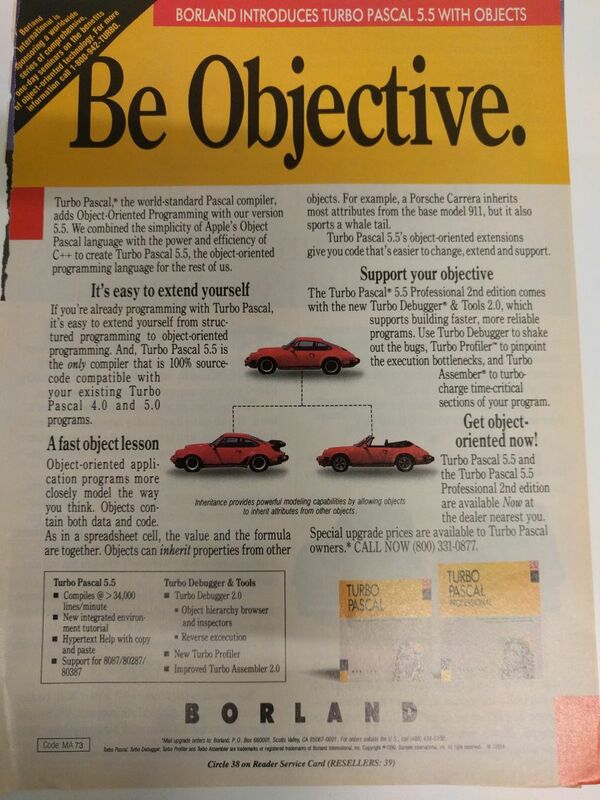 Even if the product was a bit simpler (with the product matrix fitting a single page) it was powerful. 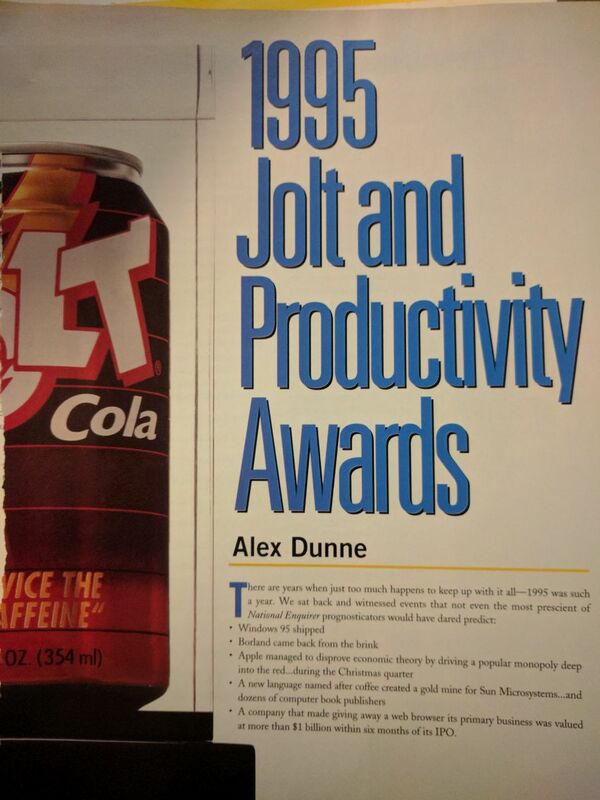 And magazines focused to it, for which I occasionally wrote articles. 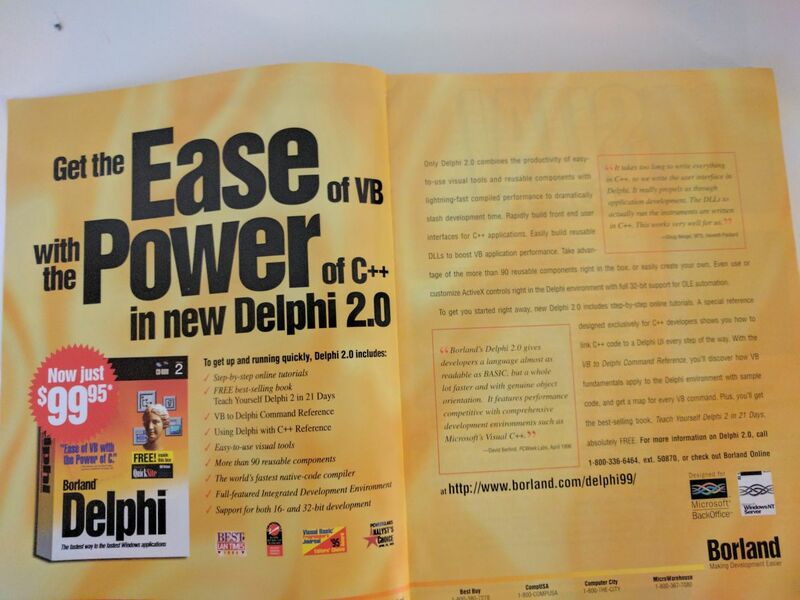 The easy of VB with the power of C++. On Time and on Budget. Power and performance. And some reviews. 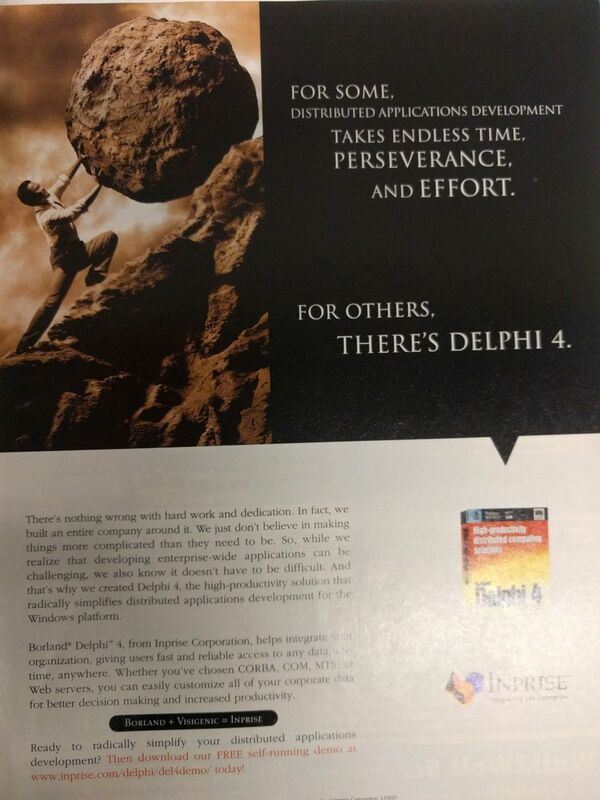 Delphi 4 (pushing rocks? 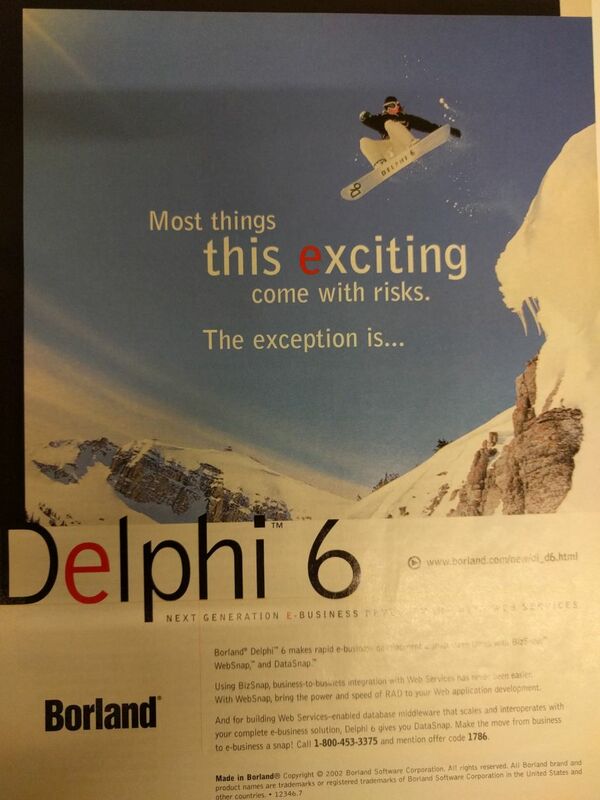 ), Delphi 5 and the Net (meaning Internet... but kind of cryptic), Delphi 6, Kylix (Linux we are coming back real soon! 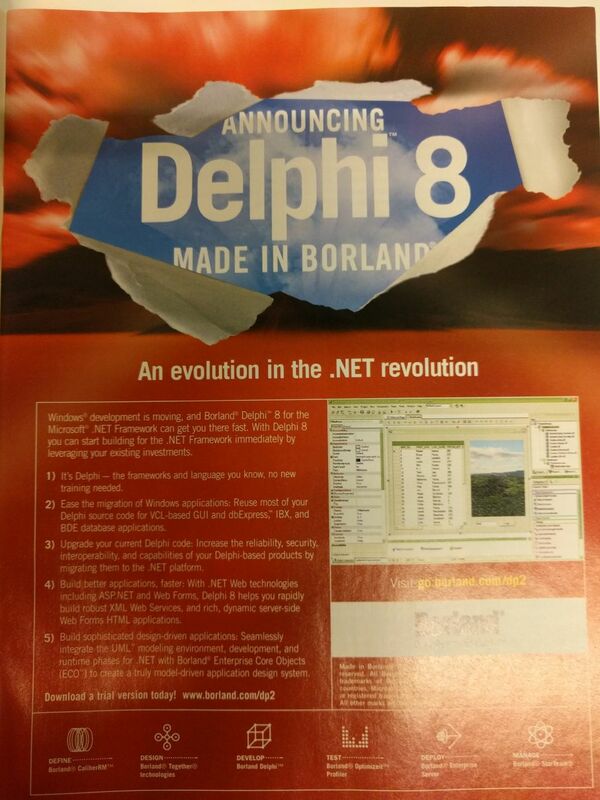 ), Delphi 7, Delphi 8 and .NET (ugh!). And a big push towards modeling! 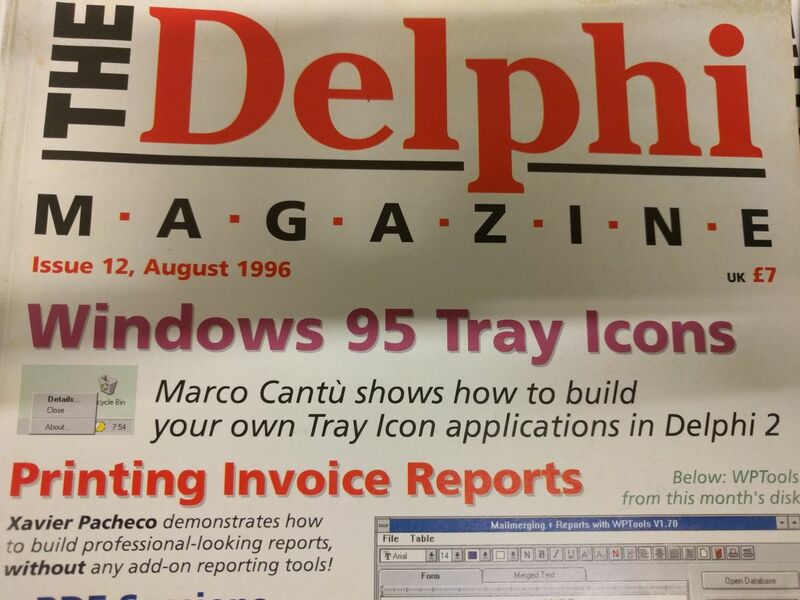 I still and always have Delphi 1 launch information at a page of my regular web site, http://www.marcocantu.com/delphibirth/. 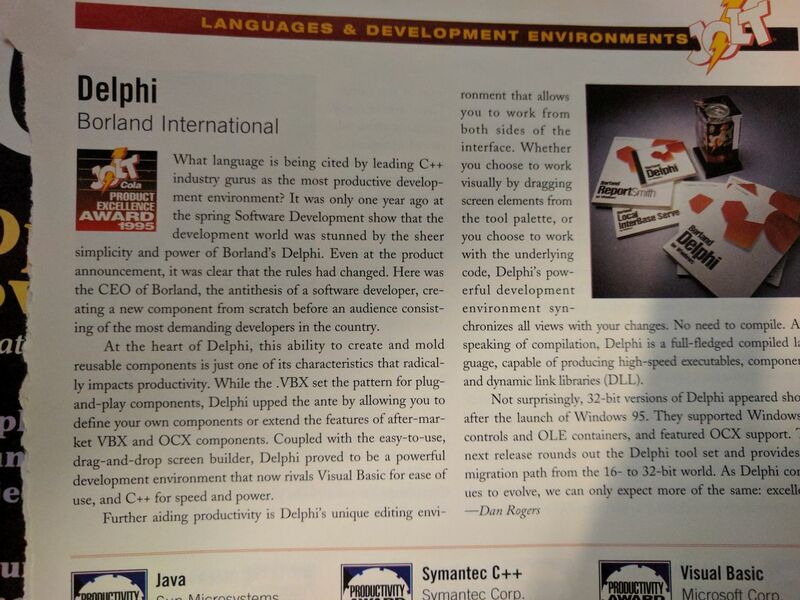 But enough of history, I'll start blogging on the Delphi language coming back to Linux tomorrow! 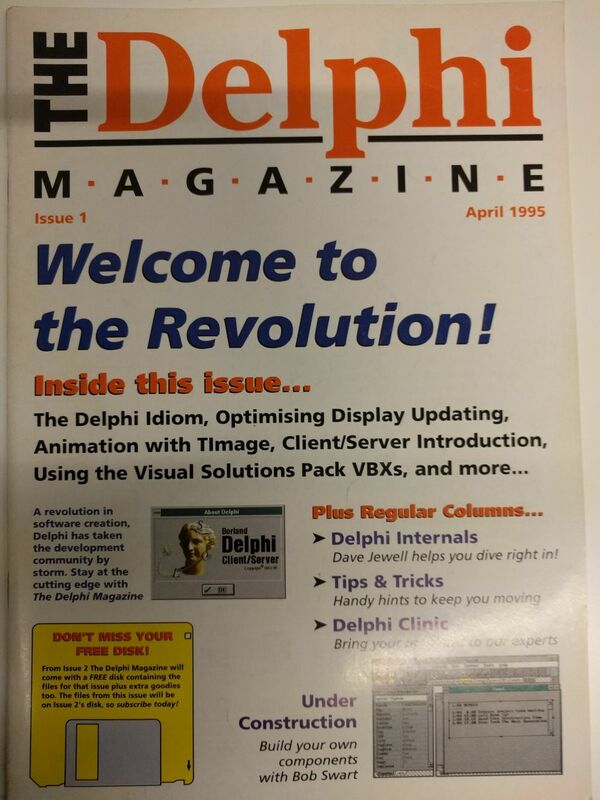 Delphi Magazine for some tips and tricks published! Thanks for posting such many images! 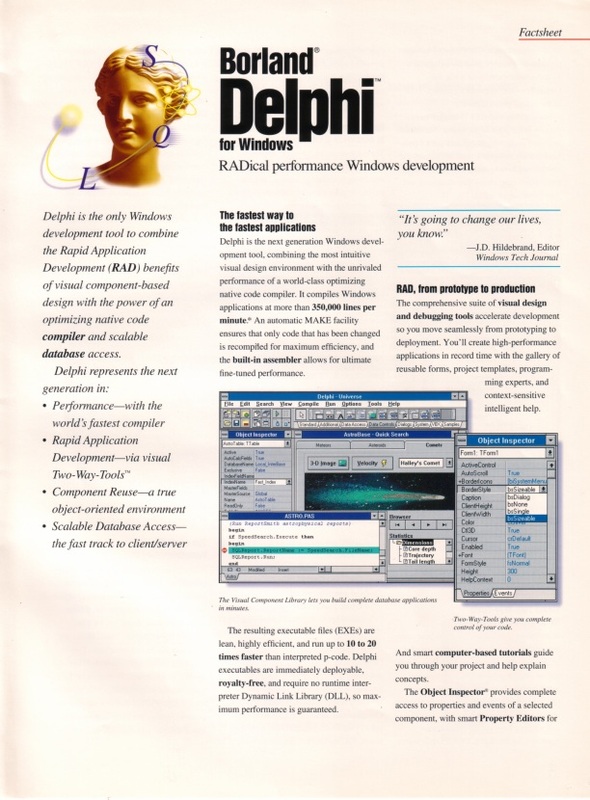 central repositories like GetIt and Delphinus. can use your favorite script language with native bindings. needs to be free, but at least split the product into smaller units (e.g. 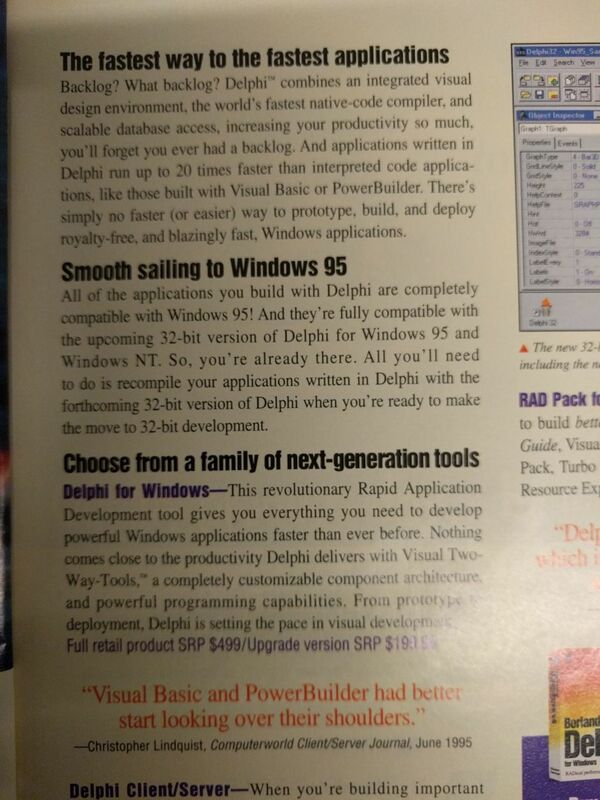 Windows VCL only) and make those units cheaper. Yay, Marco, you're still around! desperation as to try to get my head around it. was just way too big a job. many of which I've used! has 70% market share in domestic market. 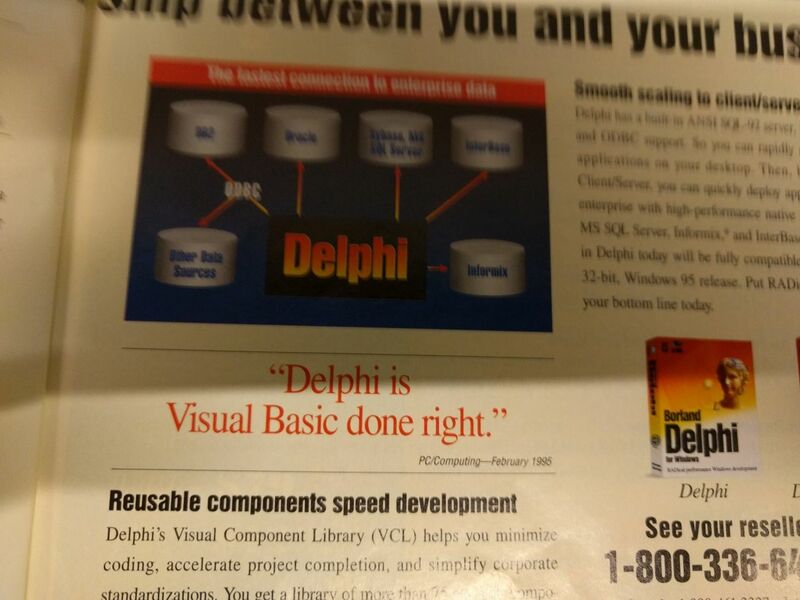 I love DELPHI and It still Rocks. 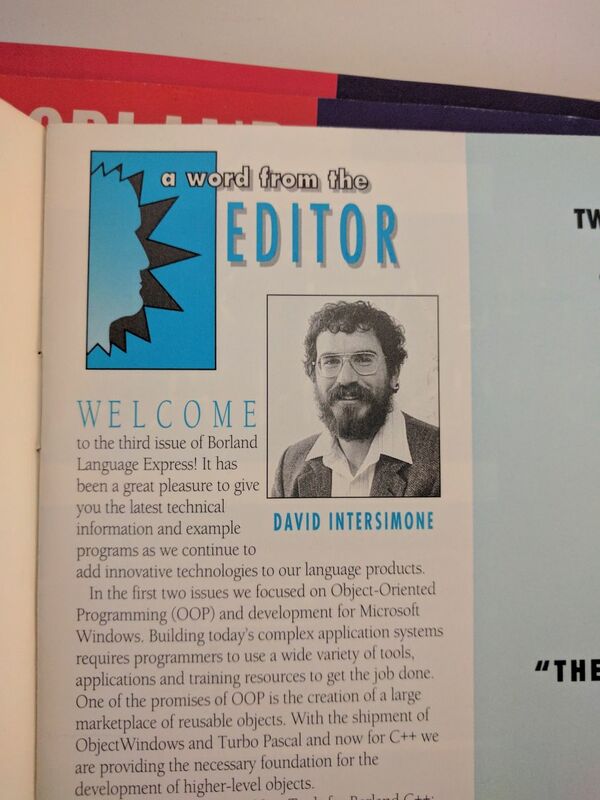 David surely hasn't changed much in 22 years. 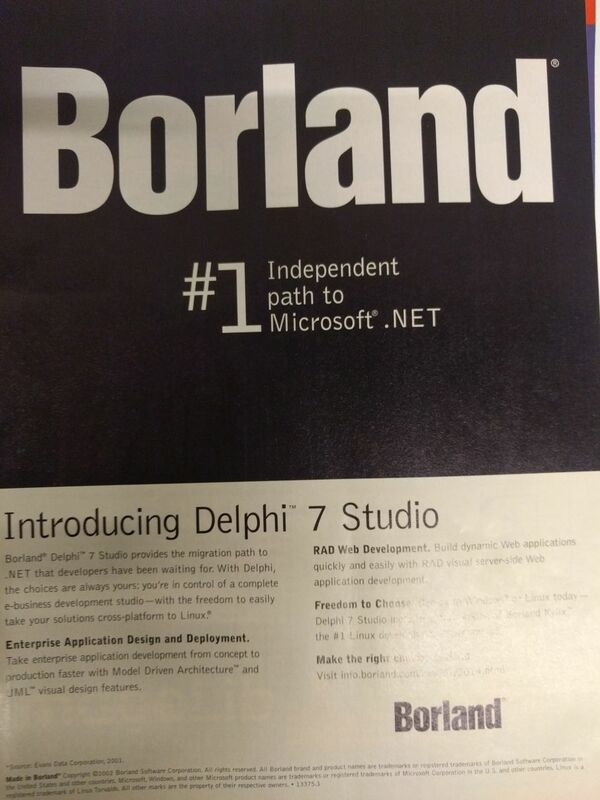 That was my approximate path to Delphi. 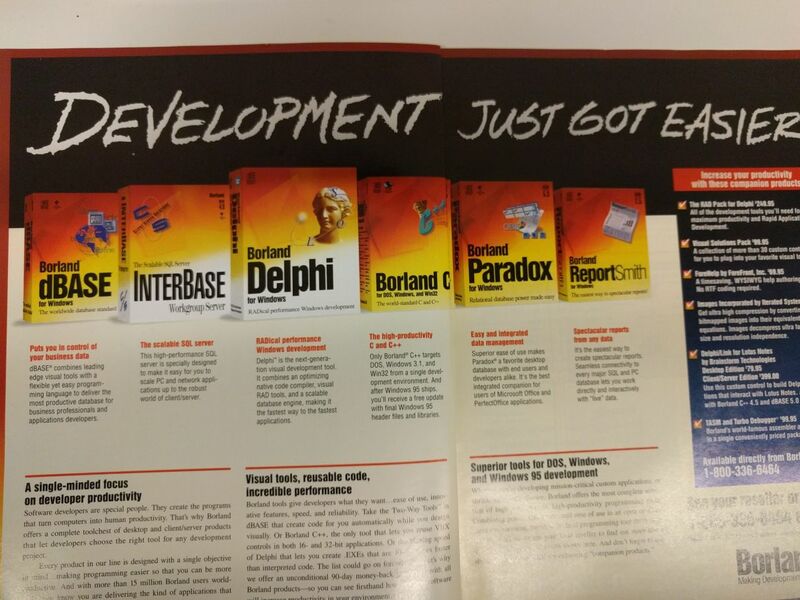 around Java, C++ and C# due to various projects. 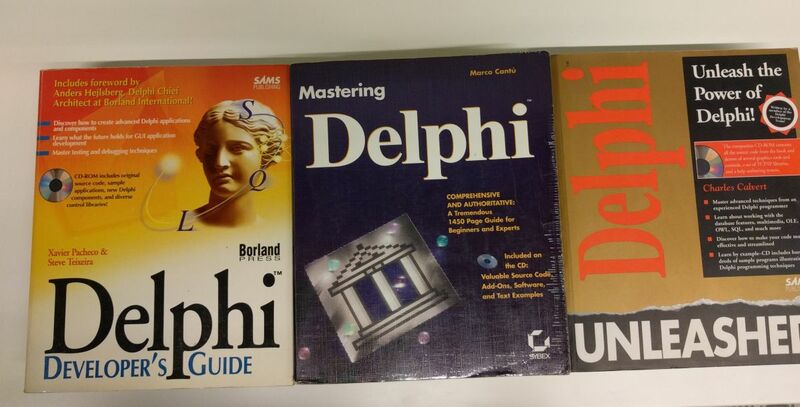 But my favorite is Delphi. 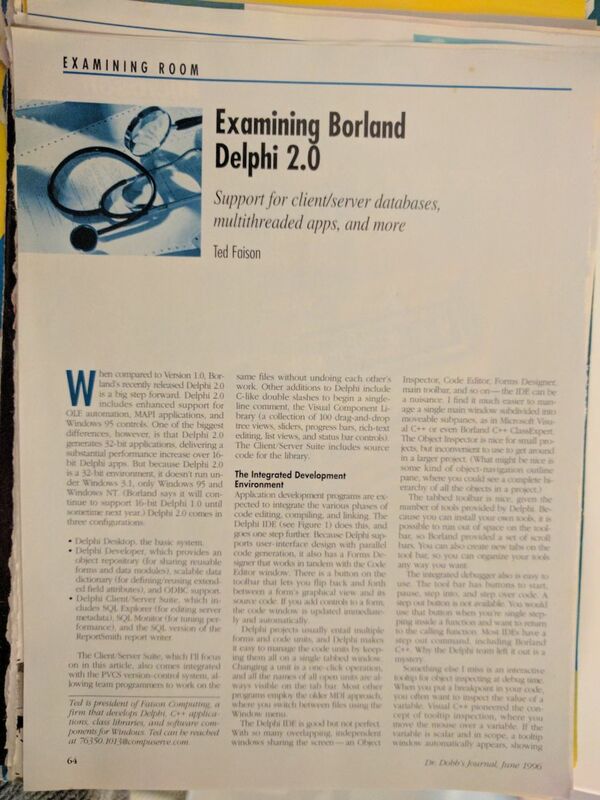 22 year ago I had been recruited to rewrite an application in Foxpro. 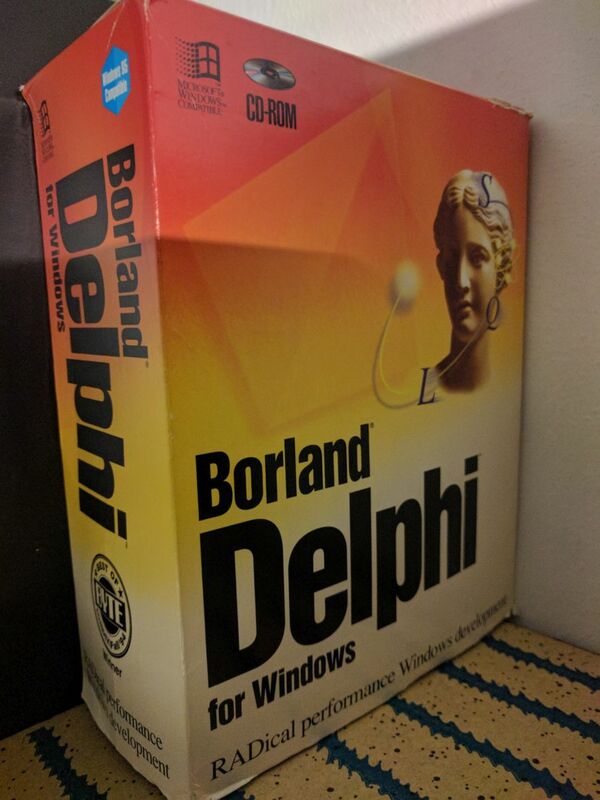 company called Borland were shipping shrinkwrapped Delphi 1.0.
latest project. Good decision then,  Good decision now. 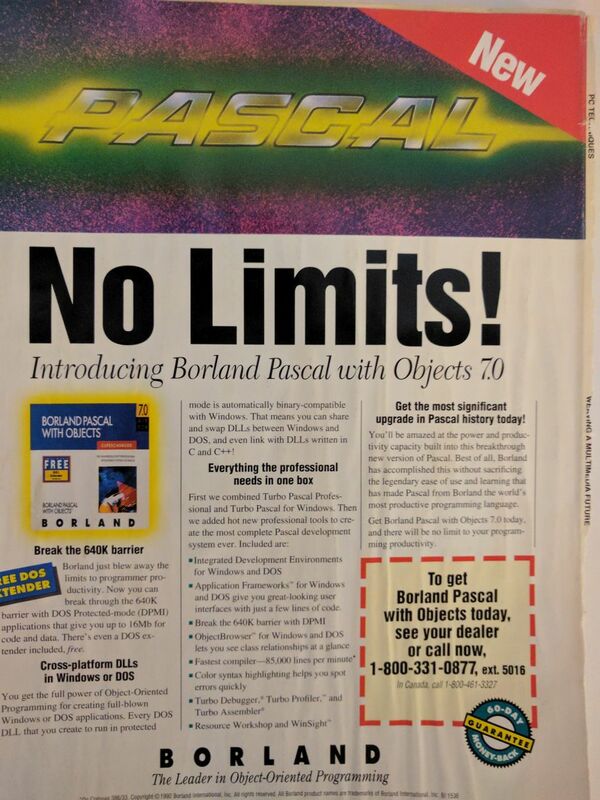 May it rock for another 22 years.. I would post pictures but long long gone. 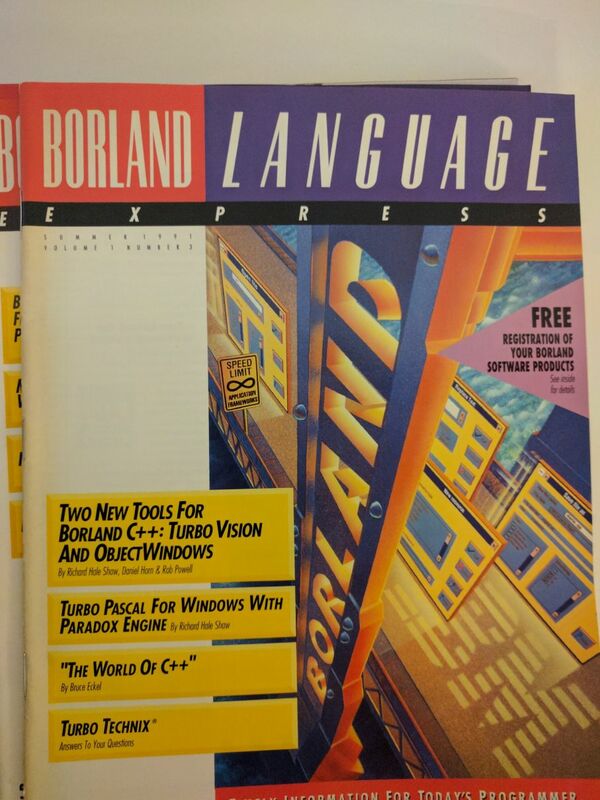 course in BASIC and then moved on to Turbo Pascal 3.0. 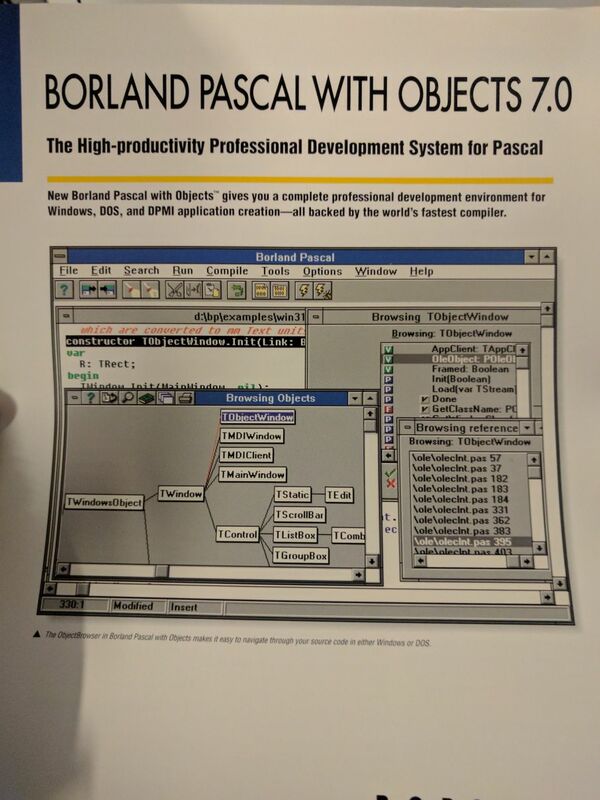 Pascal package for Windows was as difficult as C++. have too many projects going on to take the time for it. over ten years! (That's a compliment to it's usefuleness.) Still on XE5. out. I blogged about it at the above link. component definition from the internal representation. 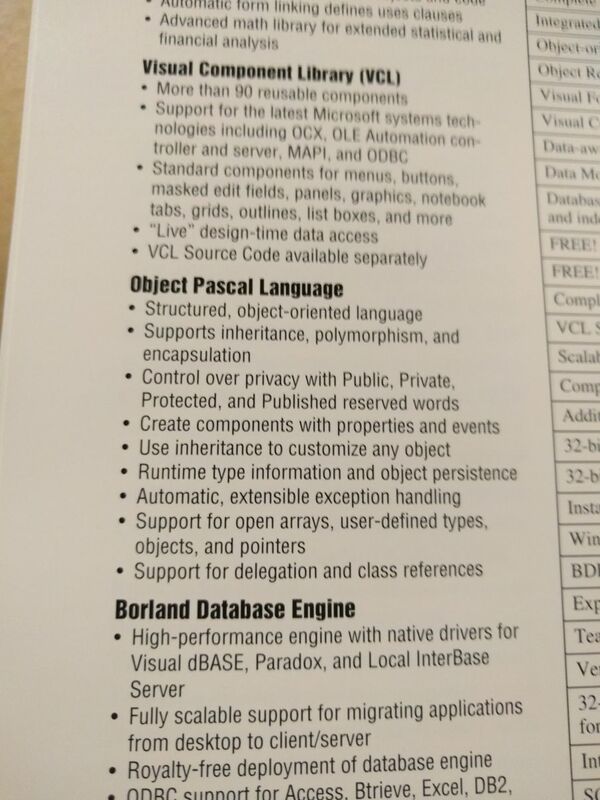 Microsoft, but Borland over-extended itself. What a trip it's been. syntax rules, my programming became easier. 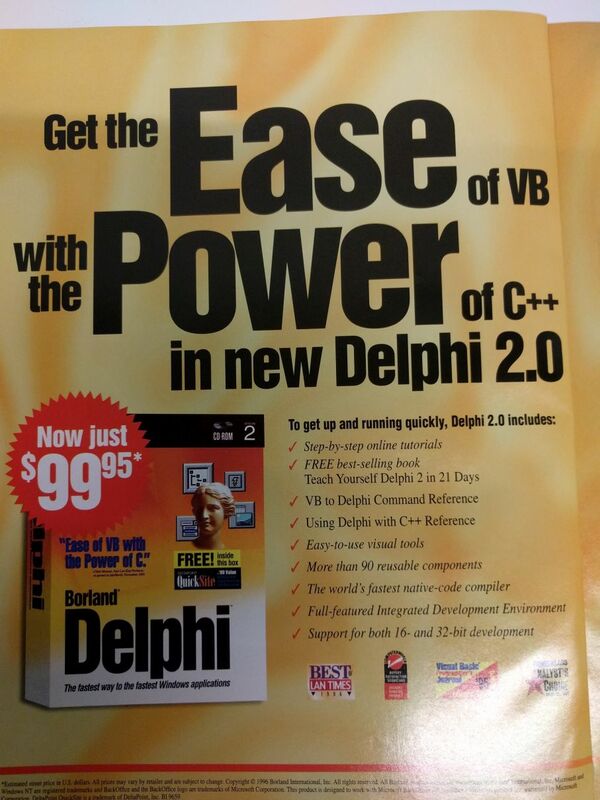 have to use C++ or C# again! 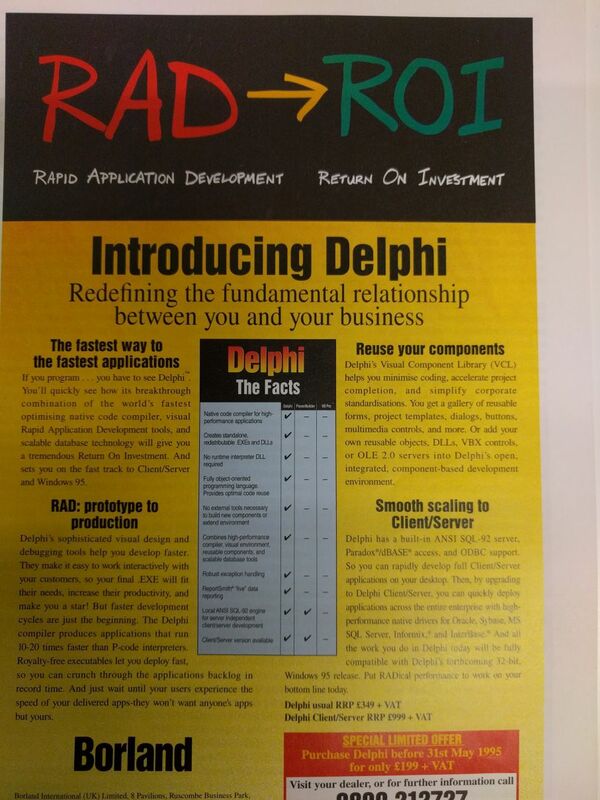 My Life changed when i decide to use Delphi and still does!!! 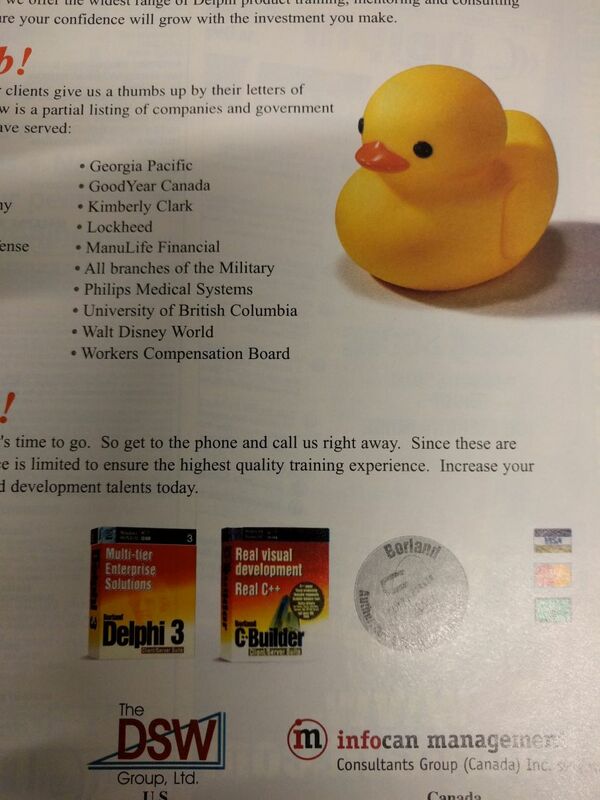 used for both study and professionally. 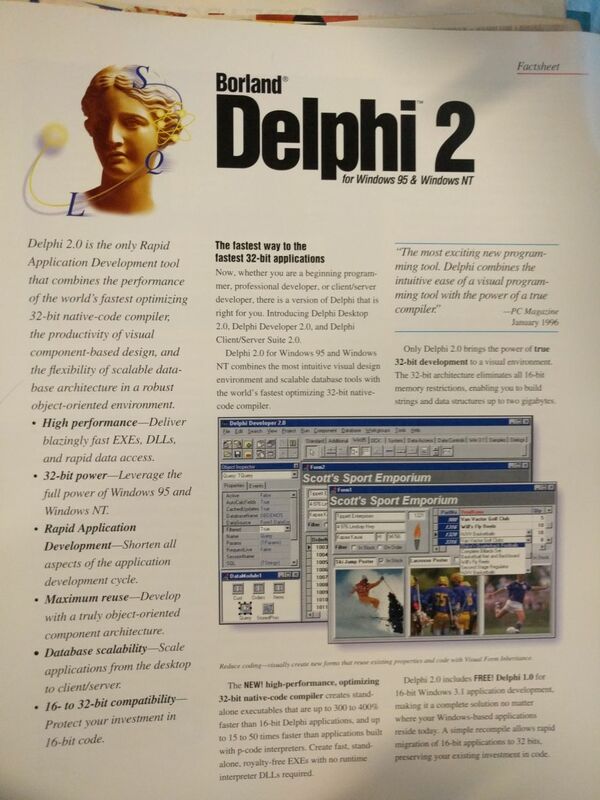 I learned a lot from Delphi 2, 3, 4.
versions and later the Community version. 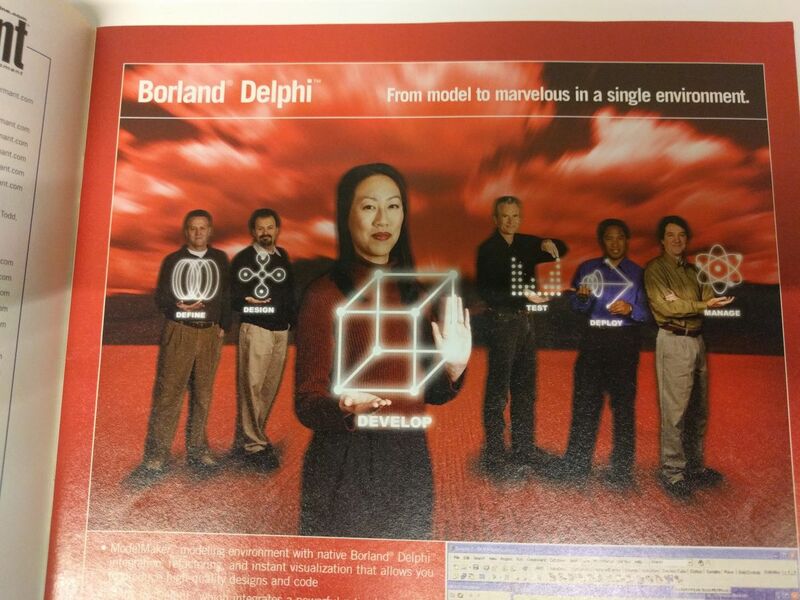 When Borland created Delphi, it becames even better. development team by the support. 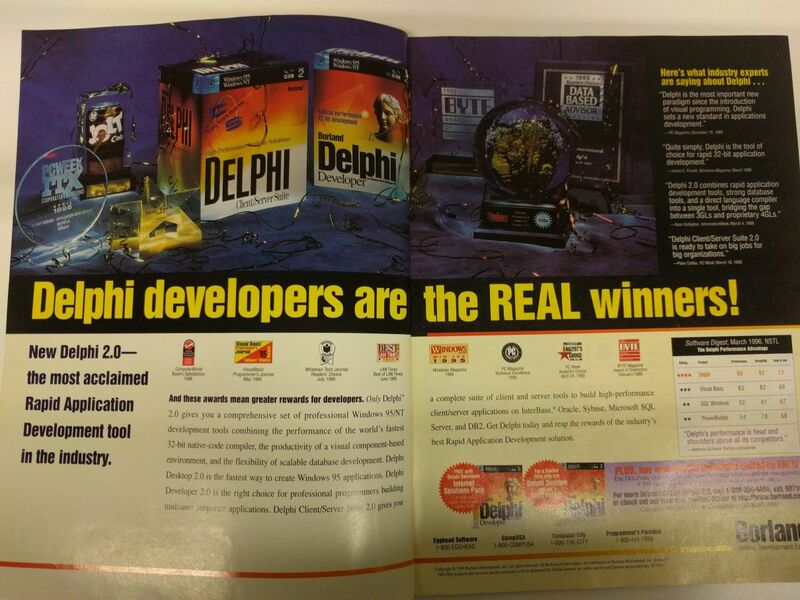 And long life to Delphi! Sorry, but I tend to disagree. 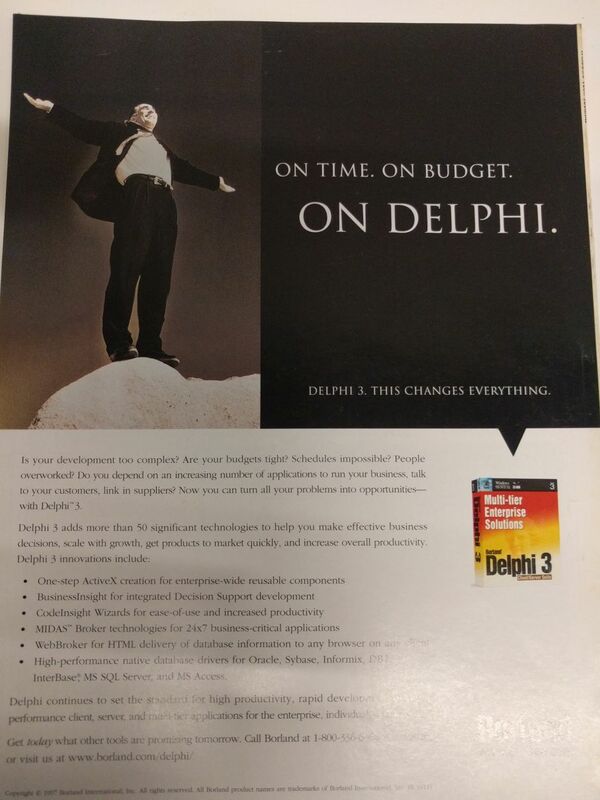 De Delphi days are sadly over. 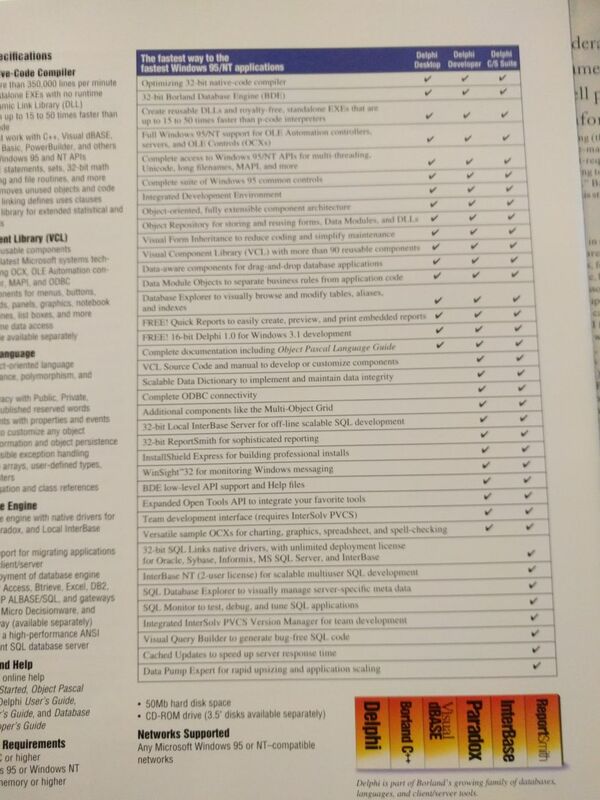 and apps mainly to administrative tasks. Hello from Mérida and Cancún, Mexico. Windows. 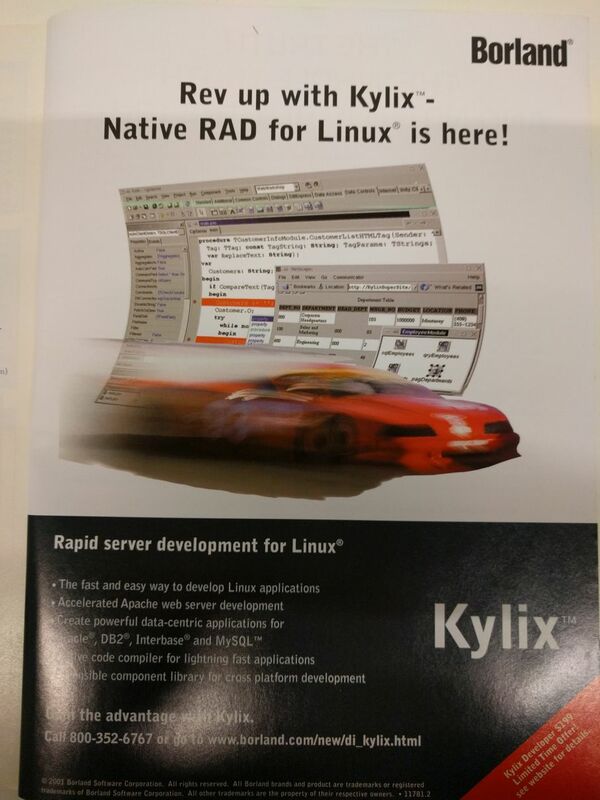 Same on the C++ side. 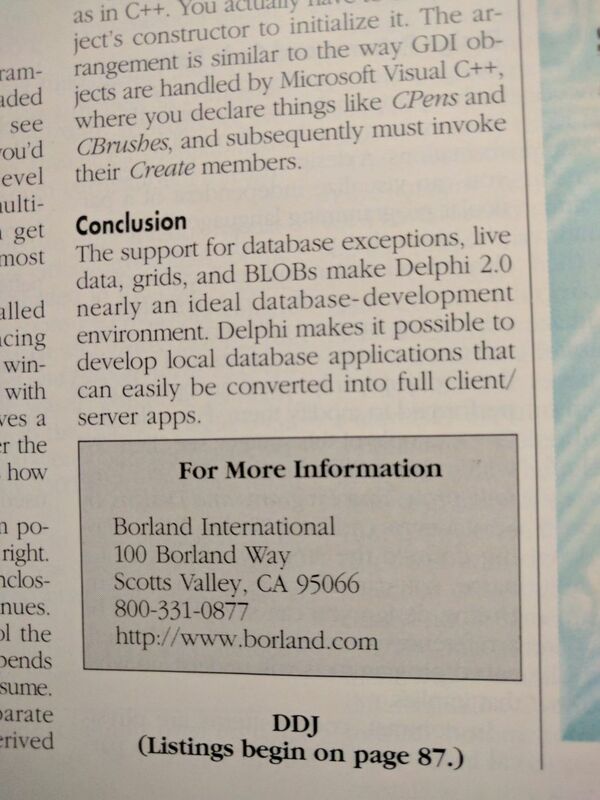 still tend to say "Borland Delphi" etc. 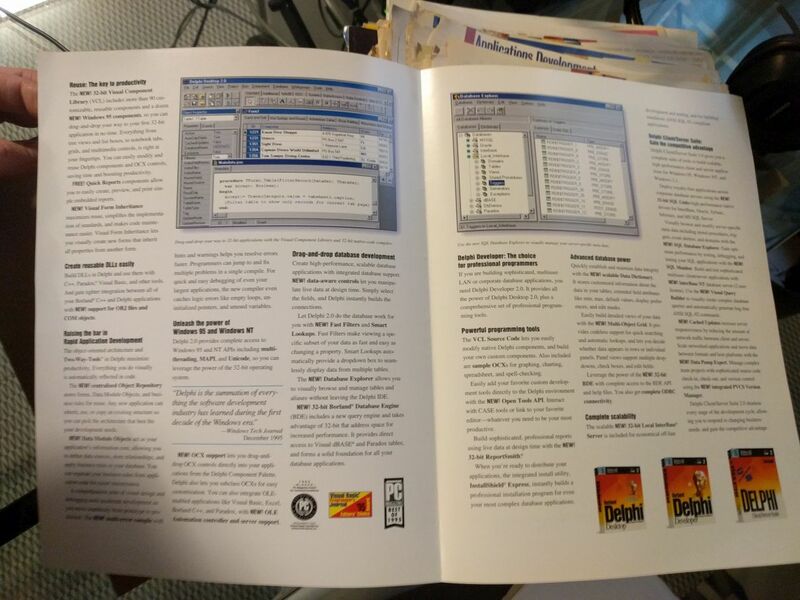 Good to see there is now a free edition for training use. 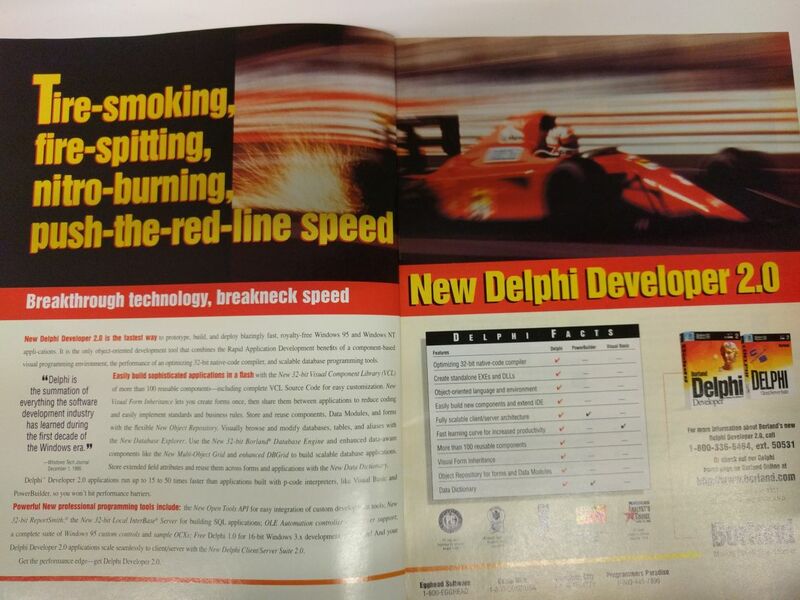 Happy birthday my dear Delphi !! components in Starter version. That would be perfect !